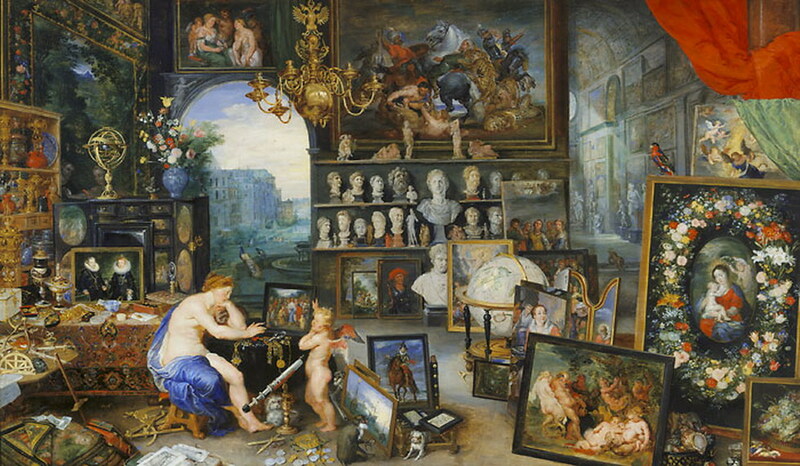 Above: "The Allegory of Sight," (also: "The Sense of Sight" or "~ Vision"), Jan Brueghel the Elder and Peter Paul Rubens, Flemish, 1617. My most favorite painting. Look closely at every part of it... Can you believe that?? Let me tell ya... the real estate market in Manhattan is HHHHHOT! 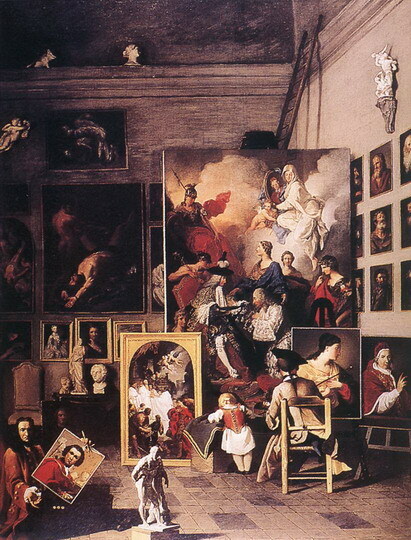 "The Studio of the Painter," Pierre Subleyras, French, 1749. 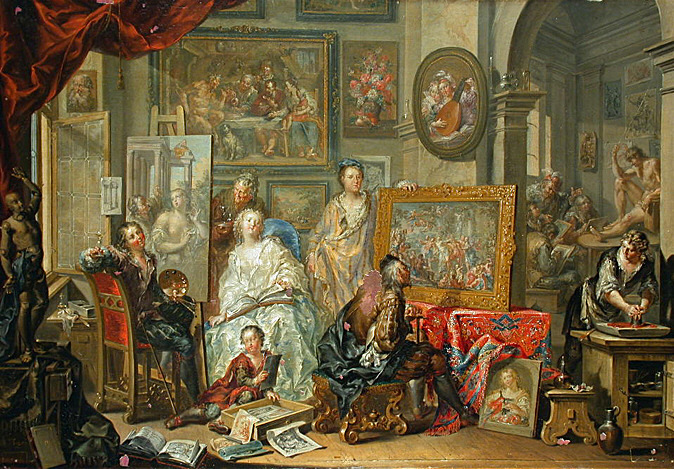 "The Workshop of the Painter " (Das Atelier des Malers), Johann Georg Platzer, Austrian, mid-1700s. 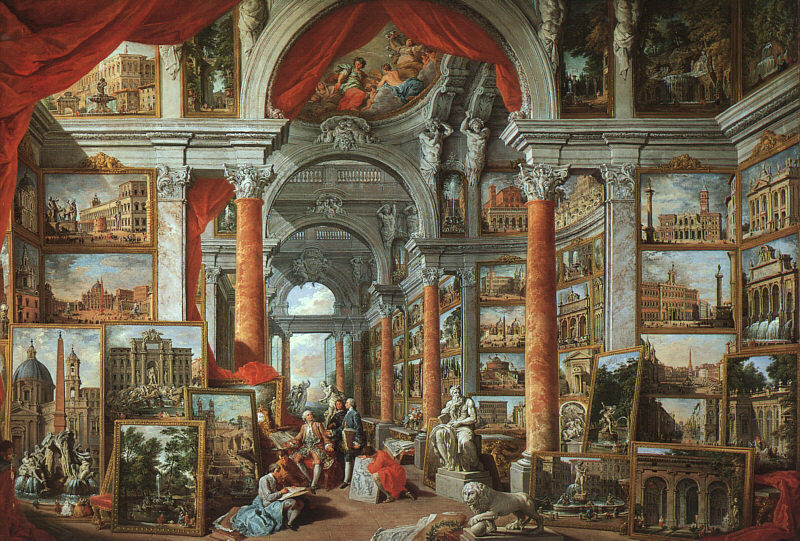 "Picture Gallery with Views of Modern Rome," Giovanni Pannini, Italian, 1757. 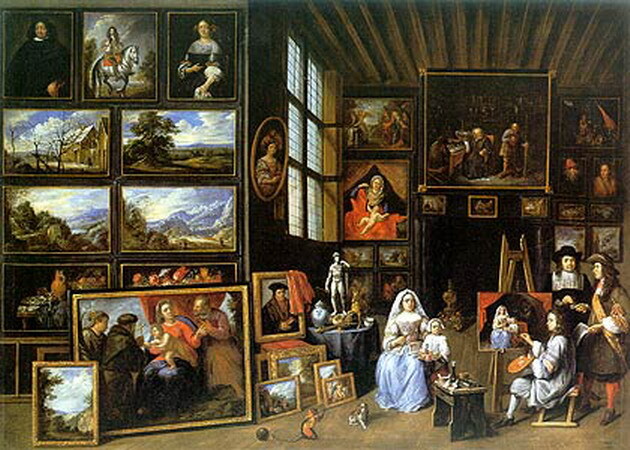 "Wife and Daughter of an Art Collector having their Portrait Done," (in German: Frau und Tochter eines Kunstsammlers werden porträtiert), Gillis van Tilborch, Flemish, c. 1660s. 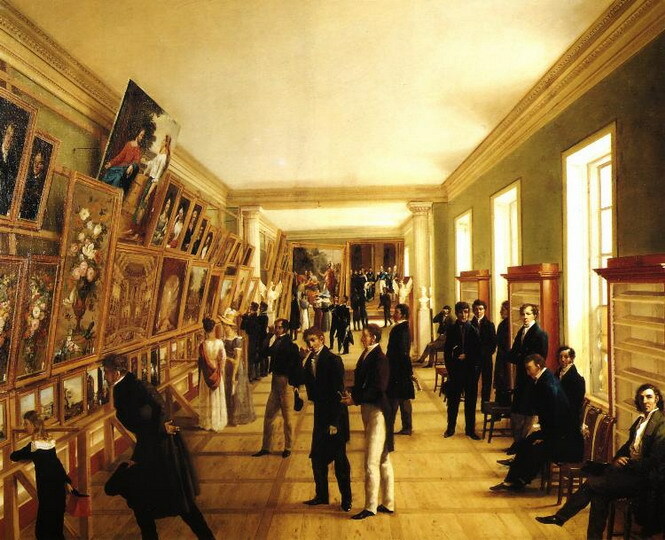 "Fine Arts Exhibition in Warsaw in 1828" (Wystawa Sztuk Pięknych w Warszawie w 1828 roku), Wincenty Kasprzycki, Polish, 1828. How cool is that? Another outstanding study in perspective. 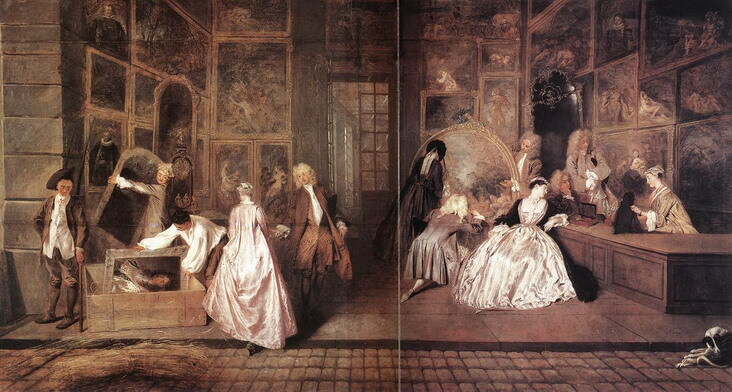 "Gersaint's Shopsign" (also: "The Signboard of Gersaint," L'Enseigne de Gersaint), Antoine Watteau, French, 1721.
and the Fashion Photograph, and self-styled shrines to models and to actresses of the silver screen. 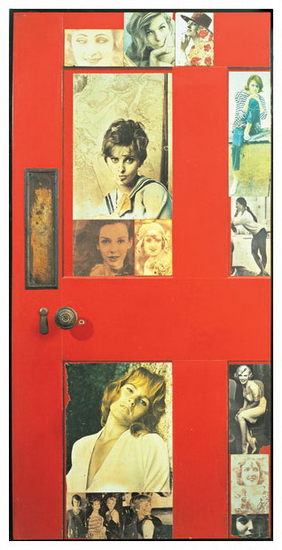 "Girlie Door," by Peter Blake, English, 1959. This is featured in the Taschen coffeetable tome "The 20th Century Art Book" as one of the defining works of the so-called pop art movement. Blake is also the guy who did the Beatles' Sgt. Pepper's album cover. These are some super-OLD pictures I took with my super-BLURRY cell-phone camera, from 2004 to early 2006, of some of the collages that were on my wall long before my creation of this website in October of '06... This is from September of '04 and you can already see what kind of stuff I like... Well, kind of. These are part of from my Fall-Winter 2004 Collection (ha), taped to the wall above my computer screen and on the wall next to me. And note the Kiwi-Strawberry Snapple and the baked potato on the edge of the window. A special collage above my TV set from October '05 -- My favorite channel? Numéro Cinq -- That's No. 5, yo. Ok... Je ne suis pas brillante. Ou drôle. Seriously: I am not brilliant. Or funny. I just like pretty pictures. Yes, I am THAT simple. Models Galore! 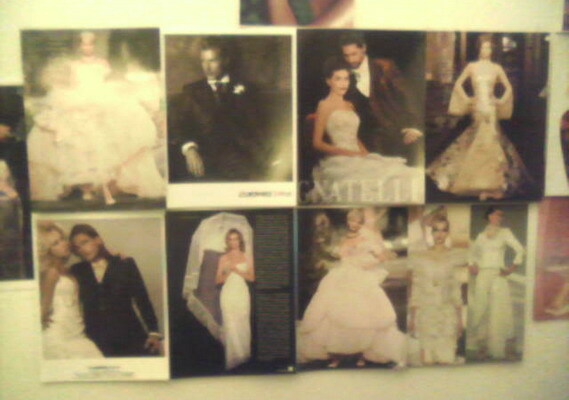 Hana Soukupova, Linda Evangelista, Bianca Balti, Valentina Zelyaeva, and then in the second row is some Italian clothing ad, then Amber Valletta for Versace, Angela Lindvall for Dior, and Tori Praver for Guess. And More: This set was done in March of '06 and includes Gemma Ward for Chanel (from British Vogue), #3 is Balenciaga, #4 is Dior, #5 is Rochas, and #8 is from Yves Saint Laurent. Obviously I remember some of my favorite designers better than other favorites of mine (and in the first 18 runway galleries of my site, I feature outfits from well over a hundred different designers. So who is my ultimate favorite? I could never decide, but I let those galleries serve as my answer to that question of who I think is "the best." Every season is different, and every outfit is different! Also from early 2006: At the left: Sasha Pivovarova from Numéro magazine, then below her is Natasha Vodianova from Latin American Vogue, and a Kate Moss ad for Burberry from W magazine, and then the right column shows Stefano Pilati of Yves Saint Laurent (yes, an excellent designer indeed) staring at one of his own creations, featured in one of the other Vogue editions; then in the second row is Doutzen Kroes for Hugo Boss, followed by Adriana Lima in a layout for Elle; and in the last row is Kate Moss for Burberry once again, and then Lily Donaldson modeling a coat by Comme des Garçons. And that one right next to my screen is Natasha Poly for Victoria's Secret... o_O eeeeeyah. 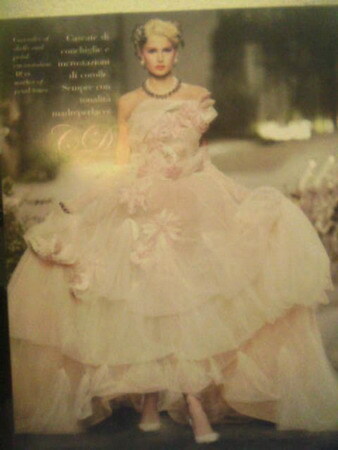 These are all from the Italian couture wedding fashion magazine Esposa... Yes, it costs like...the equivalent of 30 issues of any of the mainstream fashion magazines, but if the season was particularly amazing--and that one was--then it's SOOO worth it!!! 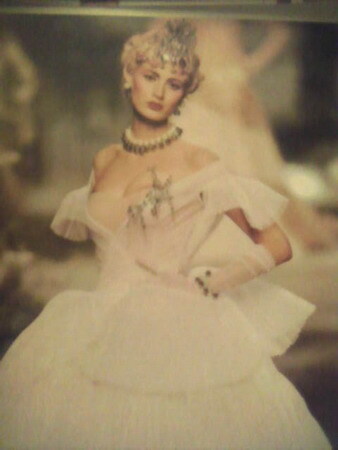 Okay, clearly I have a problem,m.m.. ..... You see, I have this uncontrollable desire to constantly surround myself with class, taste, refinement, luxury, and beauty. It's a very serious matter, but I can only take care of this urge by satisfying it, and so far, that only served to intensify it, actually. But I'm sure it'll reach a point where it'll...um...forget it. 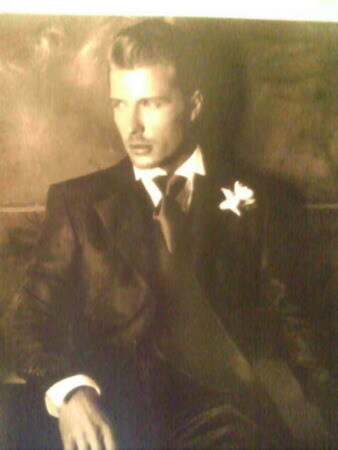 It's amazing how classy some people can look!! Wow. I love it. Latin for: To Each His Own. There's no accounting for tastes.